I recently went on a school tour in my community with City Year and had to share it with you as it's something I wish I would have known about before I graduated college. City Year is a highly regarded national service program for students ages 17-24 where students dedicate a year to helping students in public schools; benefits include a living stipend for your year of service as well as a $5,500 education award upon completion. On my tour, I was struck by the innocent faces of the children (I toured a Title I elementary school), the dedication of the principal, and the joy of the City Year corps members. 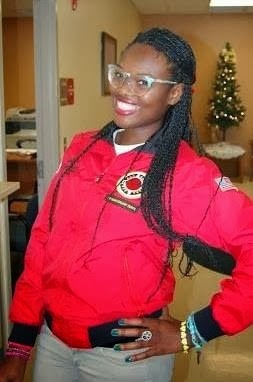 Khady in her City Year uniform. Our tour guide, a corps member, had a particular spark that radiated both from her smile and her glittery glasses. As we continued the tour I found out our tour guide's name was Khady and that she too was a community college graduate. While finishing her Bachelor's degree at UCF she is also working full time as a City Year corps member. Below is an interview with Khady so you can learn more about her journey and why City Year has been such a great experience for her so far. Being a City Year Corps member is a competitive process and it's quite an honor to be accepted. I hope her advice below will help! You can also jump here to learn how to apply to City Year! She started community college in 2009 after graduating high school and got her A.A. in Spring 2013 from Valencia College. She is majoring in psychology and is expected to graduate from UCF in 2015. She enjoys watching Netflix and Hulu and her favorite foods are salads and smoothies. 1. Why did you choose community college? I couldn't afford university and didn't know what I wanted to do. Valencia was near by and I knew some administration. I thought it would be good fit for me to grow. 2. Were there any obstacles you had to overcome in your life that helped you become who you are today? Not knowing what I wanted to do and not having a solid foundation of college educated people; I wasn't driven. Not having a drive to do school or to be educated I didn't do well at first. After working in the "real world" and seeing a cap on my potential I knew I needed to get back in school and Valencia was the place for me. 3. What was one thing you did in community college that helped you be successful? Taking time to study and read was beneficial. Valencia is a group based school and working in groups was so helpful that I brought that technique into my studies at UCF. 4. What drew you to City Year? City Year found me. I was at school and saw the City Year booth. I read up on some things and saw that it was service based organization. My background is in service so I was interested. Seeing the benefits and also what I could do for our country, I knew it was a fit for me. I even met the recruiter through a friend and he was such a great help in the application process. 5. What have you loved about being involved about City Year so far? I love being able to work with the scholars. Teaching them is different then what I have done with children before but it's a learning process. I also am the outreach coordinator at Catalina Elementary School through City Year. This is a fun part of my responsibilities because I get to write a monthly service briefing on what's going in our school. I also enjoy being the one to take all our guest around and show them the impact that City Year is doing. 6. How do you feel City Year is helping you grow towards your goals? The work load is rigorous and time consuming. I feel as though once I graduate from my service at City Year I can do anything. 7. Doing City Year and going to college full time is a lot of work! Would you recommend this or recommend doing it after college? I would recommend City Year for after college or right after high school. The work load is a lot. You are required to work a certain amount of hours for AmeriCorps certification. With the required hours for City Year and the required hours to be a dedicated college student its too much for a normal person. But it is doable. 8. 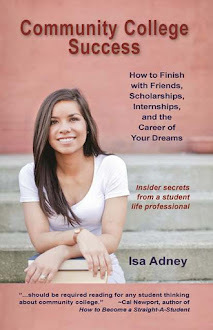 What is one thing that has helped you manage your time the most and not let your grades slip while working full time? Time management is an important part of my life. I have been working with my impact manager on how I am using my time and also what I can do to benefit my life and school. It's been a balancing act because I also have to go to the chiropractor from a serious car accident that I was in the day before City Year started. I have my iPhone that has a calendar filled with my responsibilities and I make sure that I check it daily/weekly to make sure I don't miss any due dates for school or City Year. 9. What advice do you have to a reader who would like to apply for City Year? Read into the organization. Stay on top of deadlines if you are serious about applying. Look into other cites in America if you are looking for different scenery as well. Something I wish I did was travel to a different state like some of my team mates but I'm happy to be helping my home state. If you have questions I'm willing to answer via email: hgraydon@cityyear.org. 10. What do you hope to do after you graduate as a career? I want to be a psychologist and have my own private family practice. I want to work with children and married couples incorporating art and music for therapeutical treatment. Learn more about City Year at cityyear.org or jump right here to apply!